It’s fine, but it looks a little dated to me. These are quilts I made 5 years ago (or more) and I have since started using brighter colors. I still wanted red and blue and I wanted to keep my black bed. So, I brightened up the blue to freshen the wall. I found a quilted red bedspread and shams at Herbergers, to use as a backdrop for my many quilts with red, aqua and black. This way I can rotate my quilts without having to make each one a QUEEN size. I made a set of black shams using one of the fabrics from my “At Home for the Holidays” line and my “Shams with Style” book. By the way, do you keep quilting books and magazines by your bed too? I may not get to make all the quilts from my book collection, but I can still get enjoy them by reading them over and over! 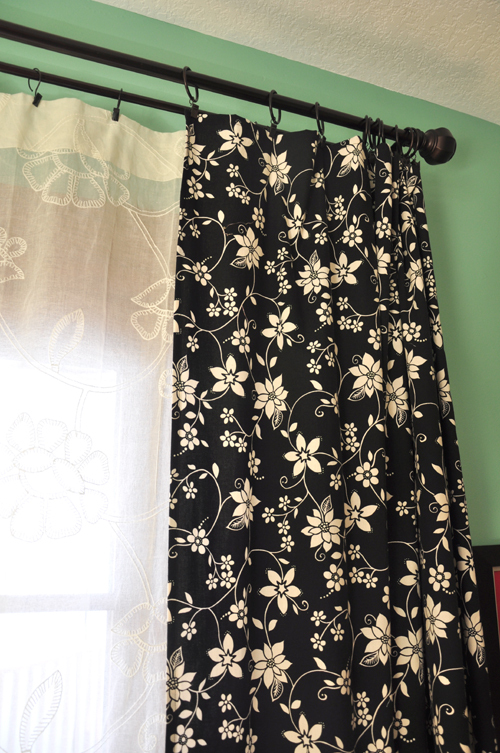 I made some very simple curtains from that same black fabric by just hemming all four sides and using a set of clips to attach them to the rod. Super easy and quick! I also made a bedskirt from the same black fabric. You can learn how to make your own bedskirt here. Details: 9-Patch Posies from the book Favorite Quilts From Anka’s Treasures. Fabric Line: Lakeside Cottage, now out of print. This is a really old Christmas line designed by Three Sisters. I love the border print. 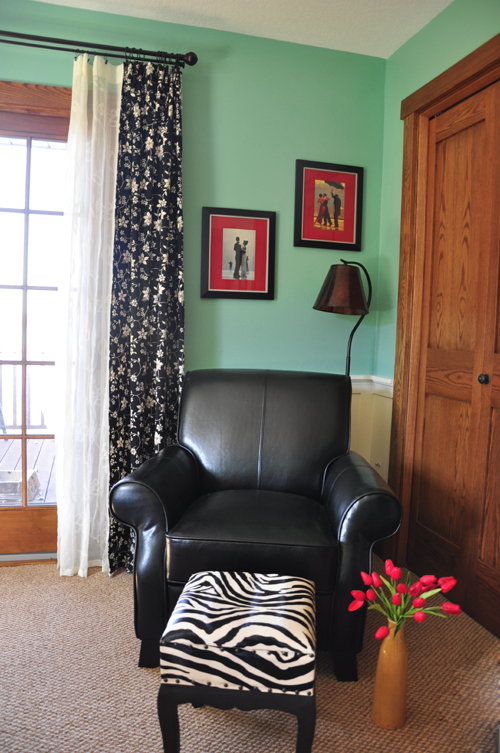 I added black to this fabric line, so it would work in this room. Details: pattern is Faith, Hope, and Love, from my book “Livin’ Large“. Fabric is 1974 by Urban Chicks. I know I have lots of other quilts with red and aqua, but I think you get the idea. I’m looking forward to having such a versatile color combination so I can have a chance to display a few different quilts. What fun to have such a quick and easy way to change up a room! Quilts – ya gotta love them. 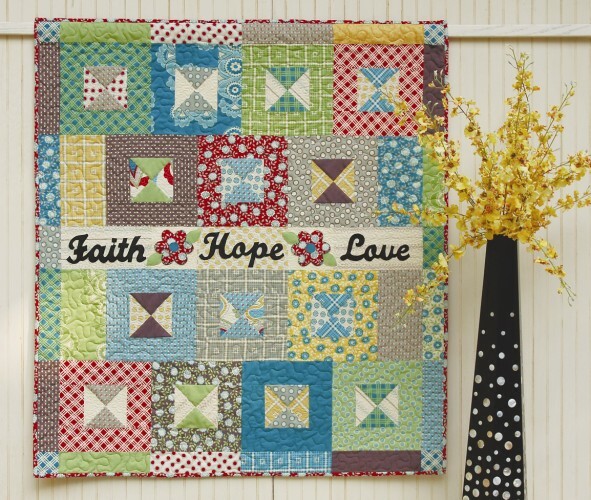 This entry was posted in Decorating, Fabric Trends, Quilting and tagged aqua and red, fat quarter cottate, fat quarter five, Favorite Quilts from Anka's Treasures, livin' large. Bookmark the permalink. 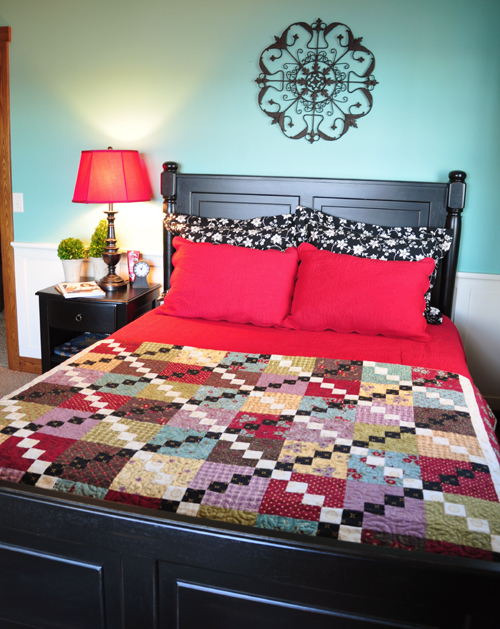 I really like the bold statement of the red quilted coverlet but you can add your own fun style too. I will have to keep that idea in mind. Wow, thank you so much for sharing your room. I wanted to make a quilt for my bed, but was hesitant about making a queen sized quilt. I hope you don’t mind if I steal your idea! 🙂 I’m now ready to purchase a solid quilt/bedspread and make some smaller quilts for the top. I love your work and your creativity is amazing. I also love the idea of the solid color large quilt and changing out the smaller main focus quilt over the top. Wow. I thought it looked great before, but it looks fabulous now. 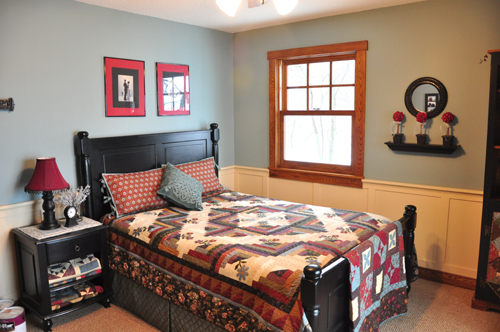 I have a plain dark red bedspread on my bed – and lots of my quilts would look nice on it. I’m going to steal your creative idea and do the same for a little change-up once in a while. Looking beautiful! Very modernized and cozy. Our bedroom has a red quilted coverlet–a Target steal at under $80 for king sized. I like having the solid to complement my fave printed sheets and throws, especially since the room is not huge. I HAVE to get Livin Large! It looks wonderful! 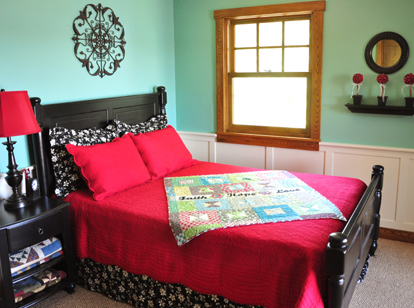 The aqua walls are lovely and the red backdrop quilt will show off all your hard work beautifully. I’d just sit in your room and stare & enjoy, if I were you! The nine patch posies looks incredible with the way you have it laid out. All of your quilts are beautiful. I had never thought of red and aqua. They each make such a difference in your room. The brighter colors are great. I am loving the idea of using a solid for a bedspread/quilt/comforter to show off a few cute smaller quilts. I’ve thought about making a Bed Runner. I’ve saw one at a hotel we stayed at recently and thought it was a cute way to dress up a bed. But, I’m liking the idea of showcasing various quilts depending upon my mood. 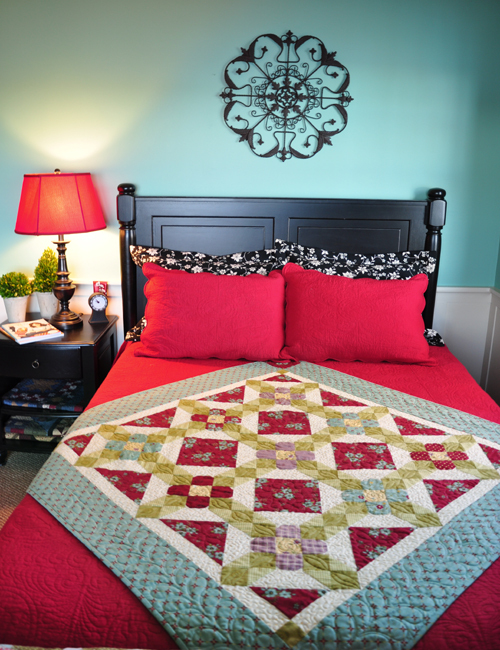 Every quilt gives the room a new look. All of which look inviting and comfortable! What a beautifully decorated room! Your quilts look wonderful on the bed too. All of the quilts are so beautiful and all look so good. Think I like the one best that has the black in it.. It just pops out at ya. The whole room is a success! Ahhh, so much inspiration and eye candy! Thank you for sharing, you’ve given me some great ideas for our guest room. I really like the artwork you have over the bed head. What is it? I so love this! Love all your quilts, and yes I also am addicted I mean collect quilt books and magazines that I will never make the patterns from, but I can’t help myself, they’re so beautiful! Everything is just beautiful. 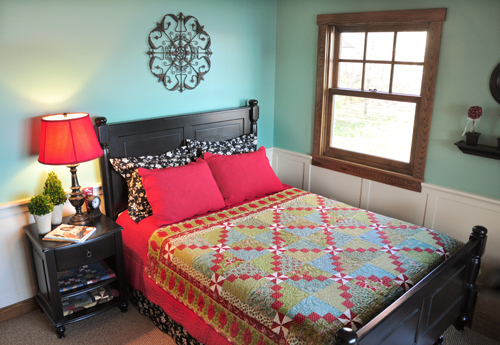 Love the room, the quilts, the pictures. Thanks for sharing. It’s just lovely! What a great idea. 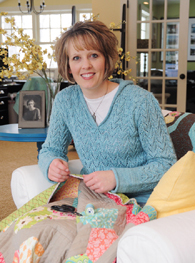 I don’t quilt myself (I just love reading your blog! ), but my mum does. She’s made me a number of quilts, but none of them are queen size, so this would be a wonderful way to display quilts in my room – I might have to borrow your idea. I love the black furniture, and chair, too. The room looks great and made me think of a question – will the clips you used on the curtain support a quilt? I want to hang a queen quilt from a rod and if I can use clips, it would lie flat rather than if I used a rod pocket. 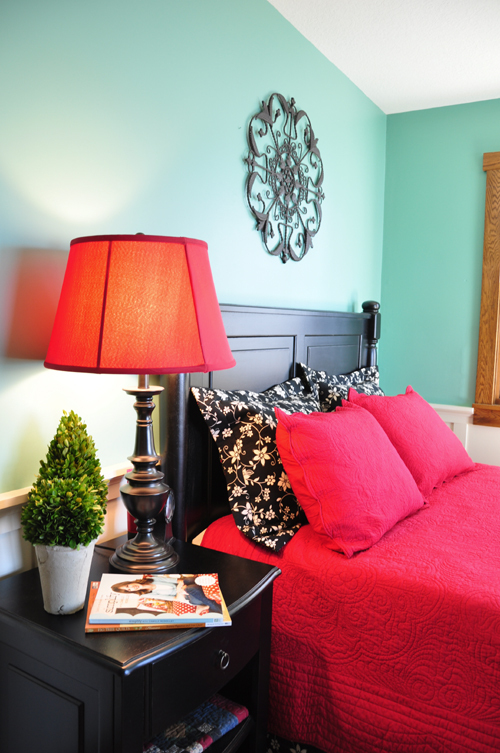 Love your updated guest room. Amazing how we change in how we quilt from 5 years ago. I love your new colors. Wonderful ideas. Especially enjoy the way the red & black work for all the quilts. Reds & Blacks have always been among my favorite colors. Enjoyed all your photos of the before followed by the fabulous ‘afters’. And each is gorgeous!! Well done!! Awesome!! The room looks beautiful. Beautiful redo!! I need to work on my daughter’s room this winter and really like your ideas and I think she will as well. I was wondering what color and brand of paint you used on the walls? She has already said she really likes the idea of aqua colored walls, so this is right up her alley. 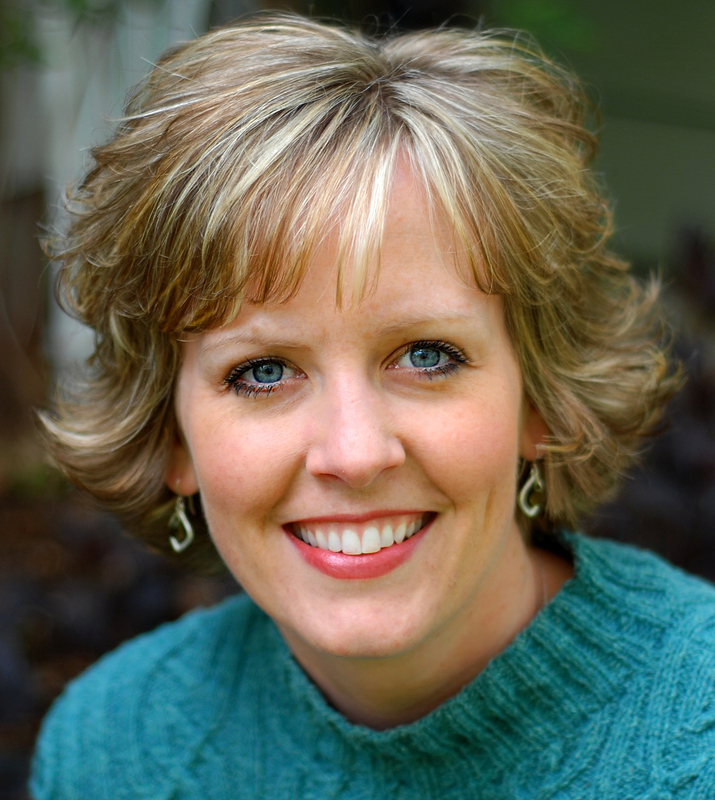 I love the red with it – really makes it pop! Positively hip! Love it! I will miss you this week. 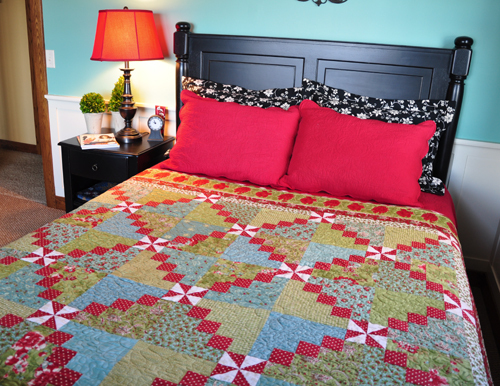 What a wonderful idea to use different quilts on top of a solid coverlet. Thank you for always sharing these great ideas. I’m not very good at this decorating thing, so these ideas are very helpful for someone like me.